The Disney princesses are going to prepare for a new dance that is going to take place in their institute and this time, it has a theme that is brightness. All want to be crowned as the queen of the shine in this dance and we will have to choose a nice dress for each of them, in addition to completing their final look. The participants will be Elsa, Anna, Ariel and Cinderella, but only one of them can win the contest. Choose a nice dress for each of the girls and add the shoes and accessories that you like. Finally, we will also choose a hairstyle that makes the dress look even more. When you finish, it will be time to go to the promotion dance and know who will be crowned as the Disney princess queen of the shine. 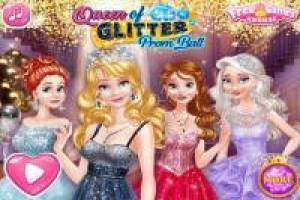 Enjoy the game Disney Princesses: Queen of Glitter, it's free, it's one of our disney princesses games we've selected.